I thought today I would go in a bit of a different direction and talk a little about Rube Goldberg. The name may not be familiar to too many non-cartoonists these days. Of those that do recognize the name, I suspect there are many that never knew it belonged to an actual person. Reuben ‘Rube’ Goldberg was born in San Francisco in 1883 and graduated as an engineer from the University of California, Berkeley in 1904. However, he only worked as an engineer for six months before leaving the profession to take a job at the San Francisco Chronicle. This eventually led to a move to New York and a career as a syndicated cartoonist. 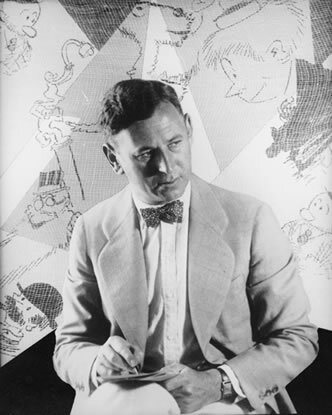 Goldberg produced several cartoon series but the comics that received the most acclaim were those that sprung from his engineering background. In these single panel comics, Goldberg would present inventions (often, but not always, credited to Professor Lucifer Gorgonzola Butts) to solve life’s little problems. These inventions, with their detailed explanations and careful labelling, were intentionally over-engineered and involved numerous trivial steps coming together to create a complex chain reaction in order to achieve the intended goal. You may have never seen an actual Rube Goldberg comic strip, but almost everyone has been exposed to a Rube Goldberg device. If you have ever played at domino toppling and, like myself, embellished the setup with falling books, pulled strings, rolling balls, and, once, a parachutist, you were playing with an embryonic Rube Goldberg device. 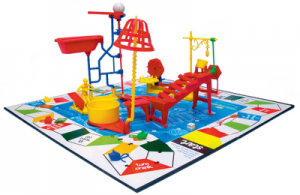 And speaking of toys, the game play of the board game Mouse Trap from Ideal was nothing special but the trap the game was based around was a great example of a Rube Goldberg device. In fact, when the game first came out in 1963 there was some controversy over licensing to Goldberg. Nothing came of it, however, probably because the game took only the idea from Goldberg’s comics. Ideas are not protected under copyright. 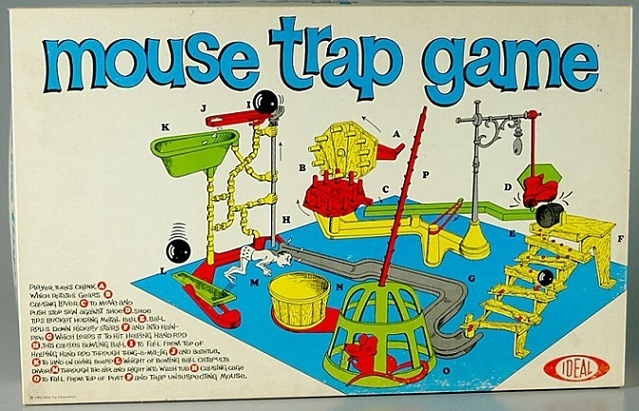 On this early version of the Mouse Trap box, the influence of Goldberg's comics is unmistakable. One place where Rube Goldberg devices found a natural home was in the cartoon universe of the Golden Age of Animation (circa 1930 — 1960). In a universe where trains barrel out of tunnel paintings and the law of gravity can be repealed, the logic of a fifteen step process to pour a glass of orange juice fit right in. – Bugs initiates a quick Rube Goldberg device. Often a cartoon will be reminiscent of a Rube Goldberg device even when no actual device is present. Chain reactions, chaotic action, and a sense that seemingly unrelated occurrences all lead to a predetermined conclusion combine to give a Rube Goldberg feel. The Roger Rabbit cartoon, Somethin’s Cookin’, does not include an actual Rube Goldberg device. However, all the action stems from a series of chain reactions with each event either triggering the next or setting the ground work for future events. There is also a sense that all events are driving to the ultimate goal of getting Baby Herman his cookie…and abusing Roger as much as possible. – Maroon Cartoons may not have come from the Golden Age, but they certainly hark back to it. Although Wile E. Coyote has used the odd Rube Goldberg device in his schemes to catch the Road Runner, the appearance of a true Rube Goldberg device in a Road Runner cartoon is fairly rare. Wile E.’s fondness for blueprinting his plans and the cobbled together nature of his creations, however, point towards a mind in tune with Goldberg. Two examples of Wile E.'s genius at work (when he isn't relying on off-the-shelf Acme products). 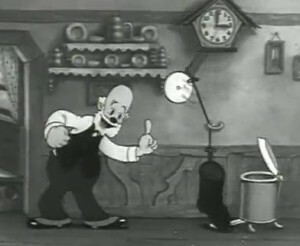 Max Fleischer’s Grampy (from the Betty Boop series) is another cartoon character whose inventions possessed Rube Goldberg sensibilities even if they often fell short of being actual Rube Goldberg devices. So what makes a really great Rube Goldberg device? Below I present a few guidelines to make-a-better-mousetrap, as it were. Please note that this list is my own and based on my personal opinions. Mr. Goldberg, himself, often violated some of my suggested directives. Stay Within the Confines of Physical Law and the Real World — It may seem contradictory to say that Rube Goldberg devices fit well within the cartoon universe and yet must obey physics. The cartoons that are the most successful, however, are those that stay within their own set of rules even as they defy physical rules. Chuck Jones, the creator of Wile E. Coyote and Road Runner, wrote in his autobiography, Chuck Amuck, how they discovered that the Road Runner cartoons followed a fairly strict set of rules and suffered if those rules were broken. It was absurdity contained within a controlled world that created the comedy. Likewise, the absurd nature of a Rube Goldberg device is more humourous against a backdrop of normalcy. Wile E. has created a pretty sweet Rube Goldberg device in this clip from Hook, Line & Stinker (1957). But the one problem I have with it is the flower. What flower grows that fast? Minimize Reliance on Human/Animal Reactions – Depending on how likely the desired reaction is, having free willed creatures as part of a Rube Goldberg device makes it less dependable. Some might find humour in relying on something so dubious but I want my overly complicated devices to be reliable. In Goldberg’s comic for a “Picture Snapping Machine”, the device relies on a Dictator mistaking an exploding balloon for gunfire and therefore falling over backward every time you want to take a self-portrait. I know it is intended to be absurd but the dictator’s inclusion bothers me because I can’t help but think at best this will only work once. Use Found Items as Much as Possible — A ball bearing rolling down some PVC tube and landing on a switch plate is a fine component of a Rube Goldberg device. A golf ball rolling down a rain gutter, preferably one still attached to a building, and landing on a mousetrap takes a device to the next level. The found items give the device a more cobbled-together feel, strengthen the idea that the events are independent and ill-fitted, and thus adds an element of awe to the finished contraption. Avoid Relying on a Single Component throughout the Device — A Rube Goldberg device should involve many trivial events tenuously linked together. If a common component is required to trigger each event, they are less disjoint and therefore less amusing. One exception to this rule is the callback. A Rube Goldberg device that reintroduces a long forgotten earlier component can add to the humour as the viewer is surprised to see a random part return. Keep the Components as Unrelated as Possible — Your Rube Goldberg device can use found objects and be comprised of distinct events but if all the events are of a similar nature or related to a common theme, they take away from the seemingly random workings of the device. You are left with the feeling of a more thought-out assembly line. In this Honda Accord commercial all the parts of the Rube Goldberg device are automobile parts. As they are trying to sell you an automobile, however, the limitation is understandable. Keep the Chain of Causation Clear — Some people like their Rube Goldberg devices to include a bunch of little side branches that do not aid the drive towards the final objective. Waving flags, fireworks, and other similar, showy activities will often be added as a means of making the device more complicated. But a Rube Goldberg device’s complexity is intended to drive towards a single simple task not the completion of numerous tasks. The humour comes from being able to see how the chain of events leads to the end result. The Purdue Society of Professional Engineers holds the world record for largest functioning Rube Goldberg device for their entry in the 2012 National Rube Goldberg Machine Contest. Without a doubt, the accomplishment is very impressive. However, one of the ways in which they made their device so large was to have it not only complete the assigned goal but also every goal from the competition’s 25 year history. The extra 25 goals require branches in the causation that do not lead to the ultimate goal. There is so much going on simultaneously that it is not possible to tell how events are triggered by previous events. If the audience cannot see the chain of causation, the device becomes a bit of an inside joke among its creators. For anyone wishing to read Reuben Goldberg’s original comics, a hard cover book entitled Rube Goldberg: Inventions! was published in 2000. A paperback edition was released in 2011 but I have read negative comments about the quality and clarity of the printing. As part of the fun of Goldberg’s comics is in the details, it may be worthwhile to chase down a copy of the out-of-print hard cover edition.